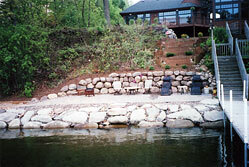 Retaining Walls were first used for the simple and necessary task of holding back the earth. Erosion is a natural process, but when your soil is being washed off your property or accumulating against the side of your home, a retaining wall can be an essential part of your landscaping. 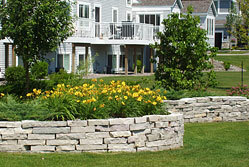 Retaining Walls stabilize a slope and protect planted areas from erosion, but they can be used to do so much more. Walls can create pathways, group plantings and gardens, add depth and texture to completely change the shape and feel of your enviroment. A long sloping backyard looks pretty, but the unforgettable reality is that often because of that good looking slope, you just can't do much with your yard. 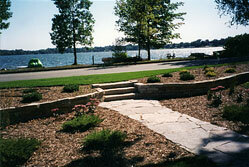 Pool, patios, garden sheds and kid's play areas require level ground. For a beautiful and strong solution to your sloping yard, consider a well built retaining wall to turn your unusable back or front yard into a safe level area of outdoor space. 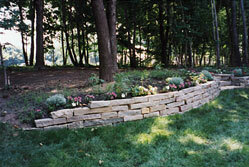 Boulder and Natural Stone walls give a natural and classic look when installed properly by a professional.